Only a few days after it was announced that Fox’s Gotham was going under the hood to bring iconic villain Scarecrow to TV audiences, we now have our first look at one of the other 700 Batman villains currently calling Gotham City home. 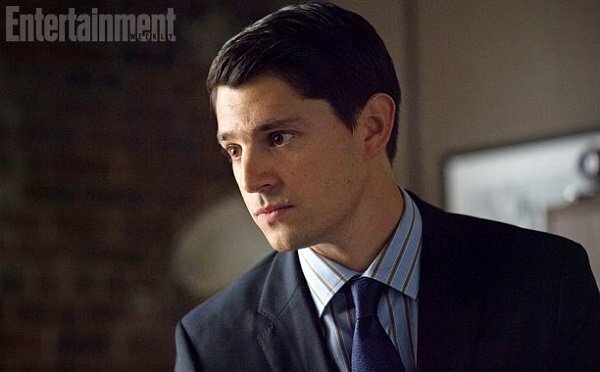 Seen above is the smartly dressed Nicholas D’Agosto, who is playing the currently one-faced Harvey Dent, better known to villain lovers as Two-Face. He barely looks older than David Mazouz’s Bruce Wayne, am I right? He’s 34, which makes him the youngest of the live-action Harvey Dents, which also include Aaron Eckhart, Tommy Lee Jones and Billy Dee Williams. He also looks a lot less filthy than many of Gotham City’s citizens. 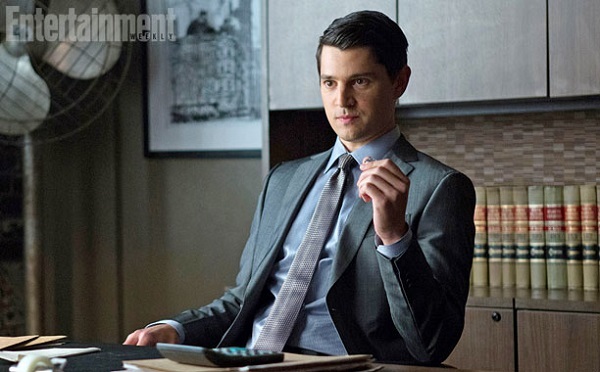 Gotham’s version of Dent will be a charming, smart and idealistic Assistant District Attorney, and one whose intentions are wholly invested in turning Gotham’s underworld into a past worry. He’s presumably going to use his good looks and nice-guy attitude to climb the legal ladder, picking apart the criminal element on his way up. Here’s another shot of him looking wild-eyed and pensive behind his desk. Of course, we all know that he will inevitably get into a huge face-scarring accident that leaves him the coin-flipping madman of the comics and films. And according to EW, who also provided the images, Dent isn’t exclusively going to showcase his White Knight side. He will also unleash “a fleeting glimpse of the hideous villain he will become.” Knowing this show, that probably means a whole host of good-and-evil winks, along with every kind of coin reference imaginable. These writers aren’t very subtle, but it’s not a bad thing. Nothing about Two-Face was subtle, either. So for now, it sounds like Gotham is sticking to the assortment of villains it already hosts, with Dent’s dark side possibly coming out after some other baddies have been vanquished. Right now, we have Oswald “Penguin” Cobblepot serving as the main antagonist, with Fish Mooney, Carmine Falcone and Sal Maroni providing the rest of the show’s criminal element. And then there are the villains of the week, of course. Viewers will have to wait just a little longer to come face to face(s) with Dent, as D’Agosto isn’t joining the series until the ninth episode, which airs Monday, November 17. It’s called “Harvey Dent,” just in case you thought something cryptic was afoot.